ABOVE: The Wittenberg Information office is across the street from the Schlosskirche. Lutherstadt Wittenberg is approximately 100 km (63 miles) from Berlin and 70 km (44 miles) from Leipzig. Road. Look for driving directions at ViaMichelin, which will also help you plan excursions between Wittenberg and other "Luther Trail" cities such as Eisenach (where Martin Luther hid in Wartburg Castle for 300 days) and Erfurt (where Luther tooks his vows as a Catholic priest before coming to Wittenberg). Ship. Viking River Cruises, CroisiEurope, and Nicko Tours call at Wittenberg during cruises along the Elbe between Berlin, Potsdam, or Magdeburg Potsdam and Dresden or Prague. The Vetter Bus Company operates local and regional buses. It has a ticket and information office at the Bus Station Wittenberg, which is next to the Hauptbahnhof or main railroad station. 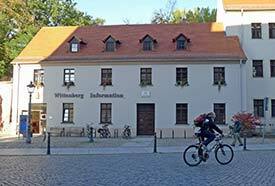 Wittenberg Information has a well-equipped tourist office on the Schlossplatz in the town center. You can pick up free maps and brochures, purchase guidebooks (see below), book guided tours, buy souvenirs, and watch a movie in English or German. The tourist office will also help you find a place to stay if you haven't booked a room in advance. The tourist office is open daily from morning until late afternoon between April and October, with shorter hours in the off-season. For details, see the Wittenberg municipal Web site's Tourist information pages. For information on vacation opportunities in the surrounding towns, villages, and countryside, visit the Tourist Region Wittenberg Web site. Saxony-Anhalt Tourism is another useful resource. The Historic Mile: Lutherstadt Wittenberg is published by Drei Kastanien Verlag. It's a small 36-page guidebook with descriptions of Wittenberg's major historic sites and a three-dimensional picture map of the town. Lutherstadt Wittenberg: Experiencing World History is published by the tourist office, and it's well worth the modest cover price. The illustrated 36-page brochure is packed with detail and includes maps of both the city center and the neighboring districts where several attractions (such as the Piesteritz car-free residential complex, the butterfly park, and the Hundertwasser school) are located. Luther Path Wittenberg is a free brochure for pilgrims. It offers a prayer or meditation itinerary with seven stations in the Old Town.